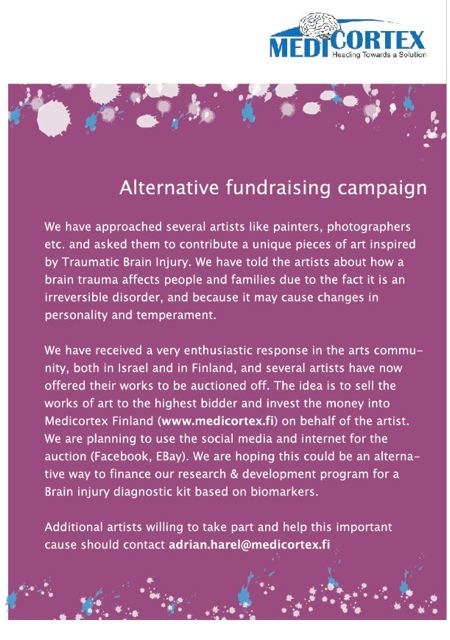 Medicortex Finland Oy has started to raise funds for the development of a diagnostic kit for people suffering from Traumatic Brain Injury through the auctioned sale of works of art. We have approached several artists like painters, photographers etc. and asked them to contribute a unique pieces of art inspired by Traumatic Brain Injury. We have told the artists about how a brain trauma affects people and families due to the fact it is an irreversible disorder, and because it may cause changes in personality and temperament. We have received a very enthusiastic response in the arts community, both in Israel and in Finland, and over 30 artists have now offered their works to be auctioned off. The idea is to sell the works of art to the highest bidder and invest the money into Medicortex Finland (www.medicortex.fi ) on behalf of the artist. We are planning to use the social media and internet for the auction (Facebook, EBay). We are hoping this could be an alternative way to finance our research & development program for a Brain injury diagnostic kit based on biomarkers and in the future developing a drug.